Today I wanted to share some interesting stats with you that I noticed whilst having a look around my analytics this morning. This shows that you are potentially missing out on a lot of traffic if you are NOT utilizing some of the top authority sites on the web. In this example, it is Stumbleupon. 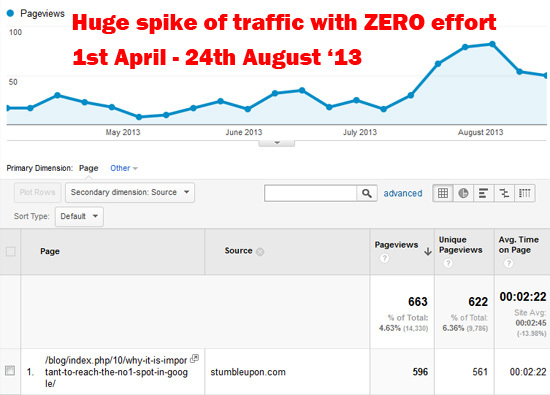 I have said time and time again about the traffic that Stumbleupon.com can send to your site. Stumbleupon is a PR8 website and is ranked 189 in Alexa which makes it one of the busiest sites in the world. I wrote and published a blog post (on this blog) a couple of years ago on 21st October ’11. My analytics shows that I am getting consistant traffic from Stumbleupon to that old blog post. 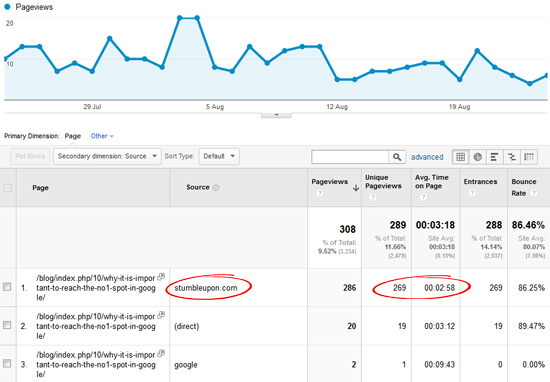 In fact, it’s not just consistant… it is seeing an increase in traffic. The great thing is.. I am not doing a single thing to “get this traffic”. It just comes in on auto pilot each and every day. Also, the content in the post itself isn’t outdated so it’s win win for me! 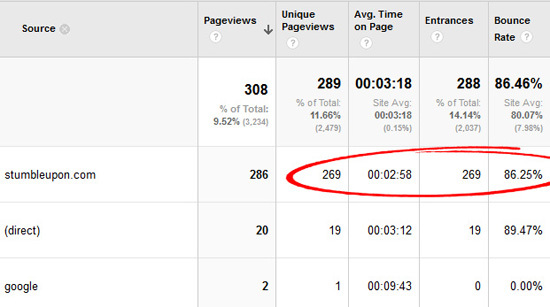 In the screenshot above you will see that Stumbleupon has sent 269 unique visitors to my blog post in the last 24 days. Those visitors have spent an average of 2 minutes and 58 seconds on the page.. and around 13.5% of those visitors clicked through to another page on my site. I do not think that is bad at all for FREE effortless traffic. What is even more interesting is the fact that this traffic has seen an increase over the last few months. Below is a screenshot showing stats since 1st April upto 24th August ’13. Use Stumbleupon and other high traffic sites where you can and LEVERAGE their traffic. Make sure you either monetize your pages or at least include an optin form or lightbox popup so you can build a list of subscribers. Then, every time you publish a new blog post.. submit it to Stumbleupon and include a good description and relevant keyword tags. You won’t necessarily see a barage of traffic to all of your submitted pages… and I have yet to find out WHY this blog post of mine is seeing consistant daily traffic from Stumbleupon. All I do know is that if you aren’t submitting your posts to some of these top authority sites you ARE missing out on traffic… and that can’t be a good thing. Before you leave this blog post I just wanted to give you a quick heads up about a new SEO link building product that is going live tomorrow. I have just been given a copy to look over and have had a chat with the creators. The guys behind this are true SEO guys and do this full time so I know that this technique will be rock solid. The product is a simple to follow PDF report that explains the method… and then gives you FULL instructions on how to carry out this SEO technique to gain top rankings in Google. The two guys behind this system are using it to consistantly rank for Amazon product keywords.. and they are earning consistant money doing this. Stumbleupon is a great site for traffic, I’d have to look at your post to see what attracts people. I don’t want to stumble a typical Make money online post! 1. Which other sites would you recommend reposting to in this manner specifically. Hi could do with a good way to make backlinks that work with google. What program do you use to show where the traffic comes from.? Is it a WordPress plugin? Im just starting to build an authority site and trying to use good honest methods and came across your posts. Very informative about stumbupon and as its free makes its worth using.